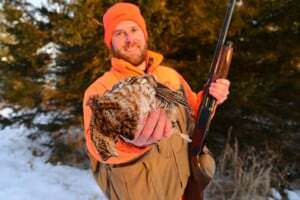 While most hunters prefer October for grouse, Peterson prefers the late season when he’ll have plenty of public land to himself. Most grouse hunters I know chase ruffs in October for obvious reasons. The woods are beautiful, the weather is usually very nice, and there are plenty of birds. While I won’t begrudge anyone for hitting the woods hard in October, I’d say my favorite time to grouse hunt is from now until the season’s end. There are two reasons. First, I don’t like hunting around the October crowds. This time of year, I have public land to myself anywhere I go. There might still be a few late-season hunters out, but they’re a rare breed. I’m a big fan of hunting public tracts of land without worrying a whole lot about running into anyone else. The second reason is snow. The white stuff can be a blessing or a curse depending on the conditions. Fresh snow is a blessing and will clearly show the story of any local grouse and what they’ve written in the powder through their feeding and roosting activities. Just like with late pheasants, it’s always nice to see fresh grouse tracks in snow that are less than a day old because you know they should be nearby. As the late season progresses, the miles you’ll need to walk to find grouse will increase, but it’s always worth it when you stumble into a patch of cover holding several wintering birds. Fresh snow also usually lets you and your dog slip through the cover quietly. This isn’t the case with old snow, which is usually crunchy and not all that fun to hunt. Remember that as the snowpack builds, random grouse flushes will decrease. 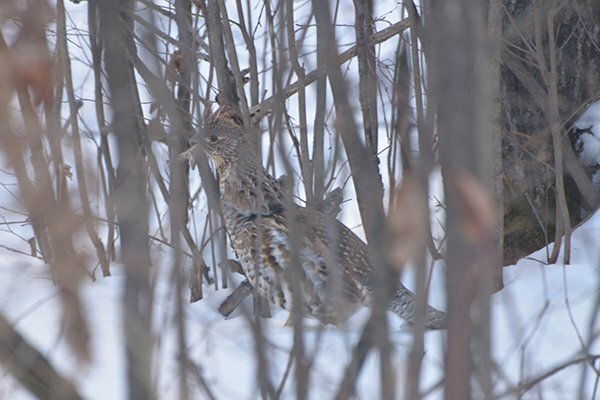 The more snow your hunting area gets, the more likely it is that the birds will congregate in certain areas. This produces feast-or-famine hunting, because all of the birds in a section might be in a couple acres of cover. Prepare to walk enough to find that cover, and when you do, get ready. It only takes one good spot to make a few miles on the boots feel like nothing more than a stroll through your yard once grouse start erupting out of the brambles.